Welcome to NevadaBrews.com, the supplementary site to the book Nevada Beer: An Intoxicating History, a book hitting shelves in Nevada (and the Internet) on December 10. Published by the History Press and Arcadia Publishing, the book is also currently available on Amazon for preorder. The launch will be celebrated throughout December and in the first part of 2019 with several signings, including the first at Lovelady Brewing on Dec. 10. Nevada Beer is just a little over ad year in the making, and before that wasn’t even a glint in my eye. As I discovered I’d be moving to Nevada in late 2017, I reached out to my publisher who I wrote Grand Rapids Beer with — and have several corporate histories in the works — to let them know, for logistical purposes. 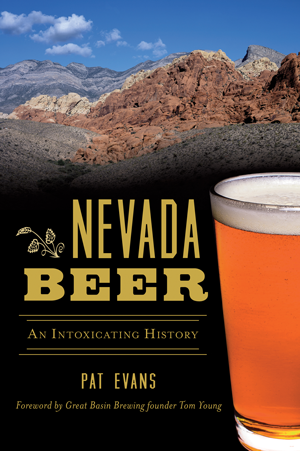 Immediately, the commissioning editor let me know they were looking for someone to write the history of Nevada beer. I was deep in the Grand Rapids, and Michigan, beer communities, and moving away, what better way to embed myself in Nevada beer. I signed my book deal in late December 2017 and turned in my initial manuscript in May. It was a quick turnaround, but I wanted to get it out. With such a quick project, I’ve undoubtedly missed some pieces in the history and certainly haven’t told the modern industry story at the depth it deserves, and really how could you? It’s always evolving. In Grand Rapids, I reported extensively on the beer industry for the Grand Rapids Business Journal and wrote the beer column for Grand Rapids Magazine (a post I still hold, as I make frequent trips back) so there wasn’t a need for a supplemental website. Here, however, I do. On this site, I hope to tell deeper stories about Nevada beer, continuing to dig up cool historical anecdotes and profile the fantastic beer culture there is here in Nevada. I also plan on launching a podcast, ideally in January, with some fairly high-profile co-hosts in the Las Vegas food & beverage community. On the podcast, we will dive into conversations about important issues, fun and serious, about culture, beer or not. I hope to continue to push Nevada beer into the minds of those outside of the state, as I’ve done already in my year here in a variety of publications, whether it’s about Reno or Las Vegas. Thanks again for checking out the website, and please do continue to come back and check as I will update it regularly. In the meantime, I hope you consider picking up my book and give it a read. Likewise, if there’s a story you’d like to see told or looked into, please reach out at nevadabrews [at] gmail.com.